The battle with Hey Ho (ヘイ・ホウ) at the end of Mushroom Hill Zone Act 1 is the standard "easy first zone boss." You will just have to wait for it to stop chopping and float down before hitting it. You can attack twice in this period if you're quick enough. Don't touch the boosters underneath the chopping bot either because they will harm you if you aren't equipped with a Fire Shield. Dodge the wood if you need to and after six hits, the fight will be over. 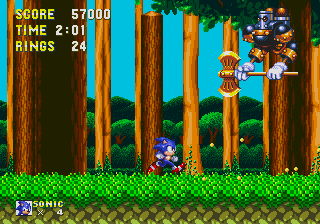 As Knuckles this fight is slightly more challenging, as Knuckles cannot hit it when it is at its highest, it bounces logs at him, and the head of the robot zooms around the stage in-between rounds of chopping the log.